Our sweet Faux Wrap dress fits and flatters – with key hole back in solid and beautiful printed organic cotton/spandex. A true classic, this dress remains feminine and practical. Menswear inspired, this piece ensures total comfort and elegance with a casual chic touch. Beautiful soft Bamboo, Organic Cotton and spandex – medium weight. *note all our bamboo is super soft – extruded viscose method produced. Flirty and feminine off-centre nect tie can be knotted or tied in a bow. A-line silhouette flows away from the body for a flattering fit on all body for a flattering fit on all body types. Wear it year-round on its own or under a blazer. 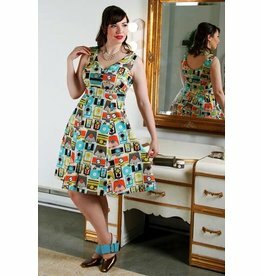 Since 2011 our cheeky, retro inspired dress line has been creating a buzz amongst fashionistas everywhere who are looking for fun dresses with fabulous fit.